This is the inspiring story of the great accomplishments of this important and distinguished devotee of the Lord and what he did for spreading pure spirituality and the universal principles that are based on the teachings of Sri Caitanya Mahaprabhu. It shows why he was called “the God-sent pioneer of unalloyed devotion to God”. On September 2nd, 1838 on a Sunday in the ancient village of Biranagara (Ulagrama) located in the district of Nadia, Thakura Bhaktivinoda took his birth in the family of Raja Krishnananda Datta, who was a great devotee of Lord Nityananda. He became known as the seventh son of Raja Krishnananda, the great grandson of Madana Mohana and the third son of his Godfather Anandachandra. In Thakura Bhaktivinoda's paternal family line, although some devotees of the Lord had appeared in the family lineage, there was not any great respect for Vaishnava-dharma and in his mother's family there was not any respect for Vaishnavism at all. Because of this, in the future he would be called daitya-kulera prahlada (Prahlada of the family of demons). Bhaktivinoda Thakura’s Godfather, Anandachandra, named him Kedaranatha. In the village of Biranagara (Ulagrama), amidst fabulous wealth, Kedaranatha Datta spent his infancy and boyhood while living in the large mansion of his maternal grandfather Mustauphi Mahashaya. In Biranagara he received his elementary education at the primary school started by his grandmother. Later he attended an English school at Krishnanagar that had been established by the King of Nadia, but after studying there a while he had to discontinue his lessons and return to Ulagrama upon the unexpected death of his older brother due to cholera. When Thakura Bhaktivinoda was eleven years old his father passed away. At that tine the fabulous wealth of his maternal grandfather appeared to be non-existent. Upon the untimely death of his relatives the grant of land that had been conferred upon his grandmother under close supervision changed owners, thus the family was put into a condition of poverty. The young boy, Kedaranatha Datta facing all of these various troubles, passed over all of them with great endurance. In 1850, when Kedaranatha Bhaktivinoda was twelve years old, by the efforts of his mother he was married to the five year old daughter of Madhusudana Mritra Mahasaya who was a resident of Rana Ghata. About that same time Bhaktivinoda Thakura's uncle, Kasiprasada Ghosh Mahasaya Thakura, who was very advanced in British education, came to Ulagrama after the death of his maternal grandfather. He invited young Kedaranatha to come to his home in Calcutta and continue his schooling there. At first Bhaktivinoda's mother was unwilling to let her son go on the plea that it was not the right time for him, but gradually around his thirteenth year Bhaktivinoda, leaving his mother and sister at Ulagrama, went to Calcutta to live at his uncle's house which was located in the Heduya district of central Calcutta. Kasiprasada was the center of the literary circle of his time and the "Hindu Intelligencer", of which he was the editor, drew many writers to learn from him the art of writing correct English. It was young Kedaranatha's business to read to Kasiprasada the articles which were presented to him to be passed as fit for publication in the "Hindu Intelligencer". Within a short time Kedaranatha Bhaktivinoda studied all the literary works in Kasiprasad's library and freely availed himself of the use of the public library. There in Calcutta Bhaktivinoda Thakura attended high school at the Hindu Charitable Institution and after four years there he became expert at reading, writing and speaking English. Becoming very ill due to the salty water in Calcutta, Bhaktivinoda had to return to Ulagrama and there on the medical advice of a Mohammedan soothsayer he recovered his health. At that time the soothsayer made one prediction. He said that very soon this village of Biranagara will become ridden with pestilence and epidemics and everything will become vanquished. He also told the young man, Kedaranatha Datta, that in the future he would become recognized as a great devotee of Lord Krishna! In 1856, at the age of eighteen, Kedaranatha Bhaktivinoda began his first year of college in Calcutta. During this time he wrote many articles and essays and had them published in various English and Bengali journals and he also gave many lectures in both English and Bengali. He studied many books written in English and also taught the art of fine speech to one well known orator who was a member of British Parliament. At this time, amidst the years 1857-1858 he composed a two part English epic entitled Poried, which he had a mind to complete in twelve books. These two books, written in very lucid, clear and melodious English verse, described the wanderings of Porus who met Alexander the Great in pre-Christ days. The eldest son of Maharshi Devendranatha Thakura, Dvijendranatha, was Thakura Bhaktivinoda’s best friend at this time. With his assistance, Bhaktivinoda purused through all of the religious books of the West. Out of affection, Bhaktivinoda would address his noble-minded friend as baro dada or big brother. As a result of his having studied all the different western schools of philosophy and many other systems of thought, the common people, unable to perceive his transcendental character, thought him to be a mere logician or rhetoritician. At this time Thakura Bhaktivinoda gave a lecture to the British - Indian Society concerning the evolution of matter through the material mode of goodness. He would show more respect to the school of Christian theology than to that of Hindu monotheism and he would spend long hours comparatively studying the books of Channing, Theodore Parker, Emerson and Newman. At the close of the year 1858 Bhaktivinoda journeyed from Calcutta to Ulagrama to visit with his mother. Upon arriving there he was very aggrieved to find the changed condition of that once wealthy and populous village which was the place of his birth. As the Mohammedan soothsayer had predicted the village had become deserted as it had been visited by an epidemic which had taken away most of its residents and its opulence and grandeur which had once been a common feature of that village but was now a mere thing of the past. After seeing this, Bhaktivinoda returned to Calcutta, bringing his mother and paternal grandmother with him. Shortly after returning to Calcutta he had to set out for Orissa to be with his paternal grandfather in his last days. Thakura Bhaktivinoda’s grandfather, Rajavallabha Datta, who was a very prominent personality in Calcutta, was living as an ascetic in the countryside of Orissa. He could predict the future and knew that his days in this world were soon coming to a close. Knowing this, he made a request to his beloved grandson to come to Orissa to be with him. At the beginning of 1859 when Bhaktivinoda was 21 years of age, his grandfather departed from this world. Bhaktivinoda was with him at this time and after receiving his grandfather’s last instructions he traveled to all the monasteries and temples in the state of Orissa. Thakura Bhaktivinoda, having now finished his education, considered as to the means of his livelihood. Although the opportunity for earning good money within the business world was there, Bhaktivinoda Thakura refrained from such means of acquiring wealth after noticing the weakness of morality among the merchants and tradesmen of that time. Without at all thinking that a wicked life full of irreligiousness and falsehood would be dependable, he considered earning a living in an honest profession such as a school teacher to be the best thing for him. Upon deciding this he traveled to the village of Chutigrama. After staying there for a few days he obtained information of a country hamlet situated quite far from the general mass of people and he got an opportunity of seeing at that place what sort of oppression and power the big landlords forced upon the ignorant and innocent citizens living there. At this time in the village of Kendrapara, not too far from Chutigrama, Bhaktivinoda established a school for English education and thus took up the profession of a school teacher. In this way he became a pioneer in introducing English education in Orissa. After some time he came to Jagannatha Puri and there in Puri, passing a teachers examination, he got the position of a teacher in a school at Cuttack and gradually, working in the position of headmaster in a high school in Bhadraka and later in Madinipura, he drew the specific attention of the school board authorities. While residing in Bhadraka, his first son, Annada Prasada (Acyutananda) was born. At this time in 1860 Thakura Bhaktivinoda wrote one book in English titled Maths of Orissa which gave a description of and report about all the various temples and Ashramas in the state of Orissa that he had traveled to. The well known British historian Sir William Hunter in his work "Orissa" has specifically praised Bhaktivinoda's moral and religious character in connection with this book. While staying in Medinipura as the headmaster of the high school there, Bhaktivinoda got the opportunity of examining various descriptions of different sectarian religious duties in spiritual discussion with the members of various religious communities. In the depraved and sinful so-called religious communities which were accustomed to the usage of intoxicants and animal slaughter, etc., there was no place for the mellows of pure devotion to God. This fact Bhaktivinoda had especially perceived from their cheap character and habits. He was also able to understand through research and investigation that Sri Caitanya Mahaprabhu was the only one to truly preach the actual religion of bhakti in Bengal. At that tine in cultured society there was not any investigation into the area of pure devotional service to Godhead. Also at that time there was not an edition of Sri Caitanya-caritamrita, the most important book for understanding Sri Caitanya’s teachings to be found anywhere. Consequently, even through much research, Thakura Bhaktivinoda was unable to collect a copy of the book. At this time Thakura Bhaktivinoda's wife passed away and in the town of Jakapura he accepted in marriage a second wife whose name was Bhagyavati devi. In the year l86l, after having given up his work in the educational system, Thakura Bhaktivinoda accepted the post of a Deputy Magistrate under the government of Bengal. After some time, having noticed the corruptness of the peons, he gave up his post as a Deputy Magistrate and was offered the position of a Collectorate Officer. During this period he established an organization called the "Bhratr Samaja". In l863 he wrote an English book called “Our Wants” and at this time he constructed a home in Rana Ghata. In this same year of 1863, during his stay in Burdwan, the Thakura composed two very novel poems in Bengali. One was entitled Vijanagrama (a deserted village) and the other poem was called Sannyasa. The style of these two poems was highly praised and admired by many big literary men of that time. An article concerning these two poems appeared in the Calcutta Review of 1863, vol. 39 and runs as follows: "We have glanced at this little volume of Bengali verse, which we have no hesitation in recommending as suitable especially for Hindu women. We do not expect that such will read the Calcutta Review, but many, we trust, of our readers will be interested in knowing what books may be safely recommended as good in style and unexceptionable in moral tone, and with that object we intend, if duly assisted, to take an occasional survey of the field of vernacular literature. “The Sannyasi in two chapters is an abler production, and reflects much credit on the author. Of the minor poems, the description of spring, and the translation from Carlyle are very fair specimens. We hope the author will continue to give his countrymen the benefit of his elegant and unassuming pen, which is quite free from those objectionable licenses of thought and expression which abound in many dramas recently published, the want of the day is the creation of a literature for Hindu ladies; and we trust that many more educated natives will have the good sense to devote their time and abilities to the attainment of this most desirable end." The rhyme and style in which those two books were written showed a complete departure from the then existing mode of writing and they gave birth to a new way of writing poetry in the Bengali language. In the year 1866 Kedaranatha Bhaktivinoda was employed in the district of Chapara in the position of Deputy Register with the power of a Deputy Collector and Deputy Magistrate. At this time he became quite fluent in Persian and Urdu. At Chapara in Saran, Bhaktivinoda had to crush a clique formed against him by the tea planters for not having complied with their unjust requests. While at Saran he visited the Gautamashrama at Godana. This place attracted his attention as fit for the establishment of a school for teaching nyaya-shastra. With this object in mind, on returning to Chapara, he called a mass meeting where he delivered a speech on Gautama (The Gautama Speech, 1866) and gained the good wishes of the people of that place. Though subsequently he did not take any part himself in the movement of which he was truly speaking, his expectation was fulfilled sometime later with the public aid, and the foundation stone of the school was laid in 1883 by Sir Rivers Thompson, the then Lt. Governor of Bengal, after whom the school was named. Also in this year of 1866, Thakura Bhaktivinoda prepared an Urdu translation of the Manual of the Registration Department (Balide Registry), of which was gladly accepted by the government and circulated throughout the United Provinces of Agra and Oudh. Gradually from Chapara Bhaktivinoda was transferred to Purniya at Krishnaganja and in the year 1868, taking responsibility of the government and judicial departments, he was transferred from Purniya to Dinajapur in West Bengal, where he was employed as the deputy magistrate. While the Thakura was residing in Dinajapur, he received from Calcutta a copy of the Caitanya-caritamrta and the Srimad-Bhagavatam. Becoming attracted to the philosophy of Vaishnavism, Thakura Bhaktivinoda would read the Caitanya-caritamrta again and again and thus he became endowed with greater faith and respect for Sri Caitanya Mahaprabhu. In this way he applied his mind very intently to the examination and study of Vaishnava philosophy. In one place in his autobiography the Thakura has written "From this time my respect and reverence for Sri Caitanyadeva was born. That seed of faith for the Vaishnava-dharma which was implanted within my heart soon sprouted. Now I love to study the Sastras dealing with Krishna both day and night." At this time with a pained heart he would incessantly submit his prayers to the Supreme Lord Sri Krishna and on the strength of his pure devotion, having received the mercy of the Lord, he realized the supreme majesty and power of the one and only Absolute Personality of Godhead Sri Krishna. At this time his song about the glories of Sri Caitanya, which was titled Saccidananda- premalankara, was published. In the year 1869 at the age of 31 while the Thakura was serving as deputy magistrate under the government of Bengal in Dinajapur, he delivered a speech in the form of a treatise he had written on the subject matter of Srimad-Bhagavatam to a big congregation of the public consisting of many prominent men of letters, religion and culture who had come from many parts of India as well as some from England. During this time he was transferred from Dinajapura to Camparana. At the time of going from Dinajapura to Camparana, his second son, Bimala Prasada took birth. While Bhaktivinoda was residing in Camparana he noticed many people worshiping a ghost who was living in a banyan tree. These dishonest people worshipped the ghost because he had the power to change the mind of the judge in the court to give the decision to favor the person who had worshiped him and the tree. Coming to know of this, Thakura Bhaktivinoda wanted to stop this nonsense mundane worship. One day the father of Pandita Ramabai, a famous girl scholar, came to Bhaktivinoda for alms and the Thakura at that time engaged him in reading Srimad-Bhagavatam underneath the tree where the ghost resided. After one month when the Bhagavatam was completed, the tree crashed to the ground, and the brahma-daitya [ghost] left for good. After this incident, in the hearts of many people there, faith and attraction for the Bhagavatam became manifest. From Camparana Bhaktivinoda was transferred to Jagannatha Puri. Upon arriving in Puri he merged into the ocean or transcendental happiness, his heart being overjoyed with the ecstasy of love of Godhead. In the town of Kamanale, which is located near the capital of Orissa, there lived one powerful mystic yogi named Bishakishena. By mystic power he could perform many powerful supernatural feats. He used to sit erect in front of a burning fire and rock back and forth, leaning himself into the fire and then again sitting erect. He would also manifest fire from his head. He had two companions named Brahma and Siva, and he declared that he was God himself who had come down to earth in his form of Maha-Vishnu. All the small kings of Orissa bowed down before his feet and would regularly send him money to build himself a temple. They would also send him women for his rasa-lila dances. Bishakishena declared, "I will drive away the British administration and sit on the throne as King of Orissa myself." He sent a circular to all places in Orissa and to Minapura. The British government thought that he was plotting a political revolution against the government so the District Governor under the national Government of Bengal sent out orders to arrest the offender. He had waged war against Queen Victoria, therefore he should be prosecuted and tried in open court. But who dared to prosecute? No one had the courage to touch him and take him to the court in Jagannatha Puri. The Orissa division then was under the charge of Mr. Ravenshaw, a District Commissioner from England. Mr. Ravenshaw knew and believed in the power of Thakura Bhaktivinoda, who was then the Deputy Magistrate at Puri. He especially requested and gave him charge of the prosecution of this bogus Maha-Vishu. On the other hand, Bhaktivinoda could not get a single man to go and touch him. They were all terrified of his heavenly powers, so the Thakura went personally to arrest him. Bhaktivinoda Thakura wanted to find out what the nature of his power was. He knew that it was the power of the mundane world, so he was not in the least afraid. When Bhaktivinoda approached the yogi to arrest him, Bishakishena showed some of his supernatural power and said to Bhaktivinoda, "Ah, you are Kedaranatha Datta and you have come here to inquire about my activities, but I warn you not to disturb my activities for I am the Supreme Lord Himself!" Bhaktivinoda then replied, "My dear sir, you are a great yogi. Why are you living here, you should come with me to Jagannatha Puri where you can have the darshana of Lord Jagannatha.” To this Bishakishena angrily replied, "Why should I come to see Jagannatha? He is only a hunk of painted wood, whereas I am the Supreme Lord personally.” Bhaktivinoda became like burning fire and immediately physically arrested the rogue who had to submit to the mighty godly power of Bhaktivinoda. On the last day of the trial the Thakura fell very ill with a high fever and suffered as severely as his daughter did. For the whole night he was awake and in the morning, with great difficulty, he was carried to the courthouse. Upon beginning the trial he declared his final judgment that Bishakishena should be thrown in jail for eighteen months under strict imprisonment for political conspiracy. While Bishakishena was being removed from the court, Doctor Walter, the District Medical Officer jumped on Bishakishena from behind and with a large pair of scissors cut off all his long hair upon which Bishakishena's power depended. Bishakishena had not taken food or a drop of water during the eighteen days of the trial so as soon as his hair was removed he fell to the ground like a dead man without any power in his body, not even enough to walk. He had to be taken on a stretcher to the jail. After three months he was moved to the central jail at Midnapura where he took poison and died in the year 1873. By this pastime Thakura Bhaktivinoda and the energy of Lord Caitanya proved that any earthly aggrandizement or power cannot stand before the godly divine power of a pure devotee of the Lord. Between the years 1874 and 1893 Thakura Bhaktivinoda wrote several books in Sanskrit such as Sri Krishna-samhita, Tattva-sutra, and Tattva-viveka which was sometimes known as Sac-cid-anandaubhuti. He also wrote many books in Bengali such as his Kalyana-kalpataru and besides those, in the year 1874 he composed his famous Sanskrit work Datta-kaustubham. Much of his time was spent in seclusion chanting the Holy Name of Krishna with great faith and love. During this time while the Thakura was living in Puri he arranged for the discussion and study of topics dealing with Krishna by establishing a society of devotees known as the Bhagavata-samsat in the Jagannatha-vallabha gardens. These gardens were formerly the place of bhajana [singing of devotional songs for meditation on the Lord] for the great soul Ramananda Raya. At this time in Puri within that society, many great Vaishnavas had assembled. Only the Vaishnava named Ragunatha dasa Babaji, who was well known as Siddha Purusha, had not joined. Due to lack of acquaintance with the Bhagavata-samasat and because Thakura Bhaktivinoda at that time did not wear the twelve Vaishnava tilaka markings or Tulasi beads on his neck, Raghunatha dasa Babaji would not come to the meetings of this Vaishnava society. Besides all this, he requested all the Vaishnavas to refrain from conversing with Bhaktivinoda about Krishna. He did not consider Bhaktivinoda to be a trained devotee. Within a few days this Raghunatha dasa Babaji became afflicted with a deathly illness. One night in a dream Lord Jagannatha appeared to Raghunatha dasa and told him to go and pray for the mercy of Bhaktivinoda Thakura if he at all wanted release from his certain death. Upon awakening the Babaji went to Bhaktivinoda and falling at his feet begged for the Thakura’s forgiveness for all his offenses. Bhaktivinoda then relieved him of his disease with some special medicines and relieved him of his spiritual disease by bestowing his blessings. Ever since that time Raghunatha dasa was able to perceive the true Vaishnava qualities of Bhaktivinoda Thakura. This shows that a Vaishnava cannot be recognized by mere outward dress or markings, nor do such always indicate someone as a pure Vaishnava. The purity is in the content of one’s character. In Jagannatha Puri there lived one babaji named Svarupa dasa. He would perform his bhajana at the place called Satasana, which was located along the ocean-side. Svarupa dasa Babaji with all his heart would show great affection for Bhaktivinoda and he incessantly gave him instructions on the bhajana of the Holy Name. Carana dasa Babaji was printing bogus books and preaching among the common people of Bengal doctrines which were not in accordance with the teachings of Sri Caitanya Mahaprabhu. He preached that one should chant the Hare Krishna Mahamantra in japa [personal chanting meditation] and nitai gaura radhe syama Hare Krishna Hare Rama in kirtana [congregational chanting in song]. In this way he murdered the mahamantra. It took a very long time for Bhaktivinoda Thakura to bring Carana dasa Babaji to his senses. When that Carana dasa finally came to understand his own mistake he fell at the lotus feet of Thakura Bhaktivinoda and said, “How could it be possible for me to rectify all the wrongs I have done. I have gone to every village in Bengal and have gotten entire villages to chant this nonsense mantra. I feel there is no hope for me.” Six months later he became crazy and mad and finally died in great distress. Lord Jagannatha had brought the Thakura to Puri, attracting him on the pretext of government work, just to accept the loving service of this worthy servant. His stay in Jagannatha Puri became transformed into service to the Lord by accepting the post of manager of the Jagannatha Temple. He became a strong faction of the government for removing the malpractices and the want of regularity in the deity worship of the Jagannatha Temple. The Thakura’s heart being very much attracted to the divine lila [pastimes] of Lord Jagannatha, he became very devoted to His service. In the courtyard of the Jagannatha Temple, where the footprints of Sri Caitanya Mahaprabhu are preserved, Thakura Bhaktivinoda established the ‘Bhakti-mandapa’ and at that place he arranged for daily discourses on Srimad-Bhagavatam to take place. At various celebrated Gaudiya Vaishnava tirthas, specifically at places like the Tota Gopinatha Temple, the samadhi tomb of Haridasa Thakura, the Sidddha Bakula tree and the Gambhira [where Sri Caitanya lived in Puri], Bhaktivinoda would spend long hours absorbed in discussing Krishna-katha [talks of Krishna] and chanting the Holy Names of the Lord. During his stay at Puri Bhaktivinoda devoted much of his time to discussion of religious works and he prepared notes on the Vedanta-sutras, the use of which was made by Sri Syamalala Gosvami in the edition which he published with the Govinda Bhasya of Baladeva Vidyabhushana. In a large house adjacent the Narayana Chata Matha near the famous Jagannatha-vallabha Gardens in Jagannatha Puri on the fifth day of the dark fortnight of Magha [January-February] in the year 1874, the fourth son of Bhaktivinoda took birth. The Thakura named him Bimala Prasada and later on he would be known as Srila Bhaktisiddhanta Sarasvati Thakura, the powerful acharya of the Gaudiya Vaishnava Sampradaya and the founder of the Gaudiya Matha. Two years previous to his birth the third son of Bhaktivinoda, Kamala Prasada, took his birth. In l874 eighty-thousand rupees from the Jagannatha Temple had been misappropriated by the Raja of Puri for his own enjoyment. Thakura Bhaktivinoda found out about this nonsense and forced the Raja to give Lord Jagannatha bhoga prasada fifty-two times a day. Because of this the Raja's money was soon diminished to nothing and he was extremely angry at this action that Bhaktivinoda took on him. He wanted to kill the Thakura but he saw that it was not possible to kill him by ordinary means. Intent on killing Bhaktivinoda somehow, the Raja then began to perform of fire yajna [ritual] with fifty learned panditas. The yajna was being performed in the inner compartments of his palace so that the public did not find out about this attempt on the life of Bhaktivinoda Thakura. Still, everyday information was coming to Bhaktivinoda about the measures that the Raja was taking to kill him. After thirty days of yajnas, when the last oblation of ghee was being poured on the fire, Thakura Bhaktivinoda was to have died at that moment, but instead the Raja’s dear and only son died within the palace when the last oblation had been offered. Taking leave from Jagannatha Puri on special business, Thakura Bhaktivinoda returned to Bengal and there visited many places such as Navadvipa, Shantipura and Kalana. After his leave was over he put in charge of the sub-division Mahisharekha in the district of Naora. After that he was transferred to Bhadraka. In August of 1878 the Thakura was put in charge of the subdivision of Naraila in the district of Yashohar. In India many panditas and educated men, having read Bhaktivinoda’s Sri Krishna-samhita and Kalyana-kalpataru, became endowed with great faith for the Vaishnava-dharma and highly praised the Thakura for his work. The lines of Kalyana-kalpataru are extremely moving and decorated with the devotional ecstasies for a highly exalted soul who is absorbed in alloyed devotion to God. In the year 1877 Thakura Bhaktivinoda’s fifth son, Varada Prasada, took birth. In 1878 the Thakura’s sixth son, Viraja Prasada, was born. Both of them appeared at Rana Ghata. 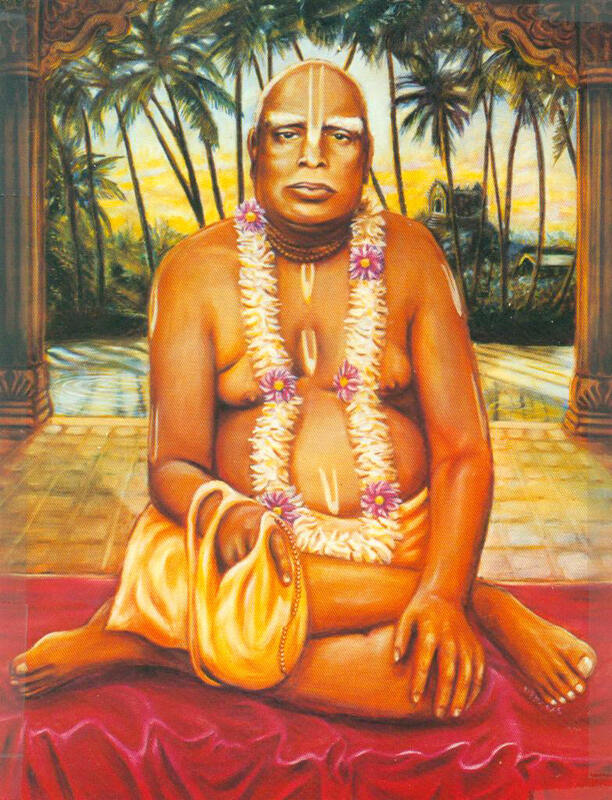 Although Srila Bhaktivinoda Thakura is an eternally liberated associate of the Supreme Lord, still, for setting an ideal example of a human being, he accepted formal Vaishnava initiation. According to the Vedic shastras one who has come to the human form of life must accept initiation from a bonafide guru spiritual master if one at all desires to cross the ocean of birth and death. By taking Vaishnava initiation from the acharya and executing his instructions one's eternal spiritual consciousness is easily revived. Taking the ideal example of Srila Raghunatha dasa Gosvami, the great servant of Lord Gaurasundara, Bhaktivinoda Thakura formally accepted Pancharatrika initiation from a descendant of the Jahnava family of Baghnapara. This Vaishnava family line is coming from Srimati Jahnava devi, the wife of Lord Nityananda. At this time the Thakura’s seventh son, Lalita Prasada, took his birth at Rana Ghata. In Naraila there were many people who had adopted the Vaishnava dharma and at this time when Bhaktivinoda was living there they would seek his association quite frequently. They could not ascertain who was a pure Vaishnava and who was not. So the Thakura would instruct them on the chanting of the Holy Name and he gave them the understanding of what was pure devotion and what was mixed devotion. From the year 1881 the Thakura began publishing his Vaishnava journal, the Sajjanatosani which proclaimed the divine teachings of Sri Caitanya to all parts of Bengal. Previously in 1866 Bhaktivinoda had gotten out for a pilgrimage to Kashi, Prayaga, Mathura and Vrindavana. So now at the close of his stay at Naraila he desired to again see the land of Vraja Bhumi Vrindavana. Desiring in this way he set out on a three-month pilgrimage to the holy place. In Vrindavana at this time there were many Gaudiya Vaishnavas residing there, amongst whom Jagannatha dasa Babaji was most prominent. He lived in his old age, six months in Vrindavana and six months in Navadvipa. When Thakura Bhaktivinoda went to Vrindavana he obtained his first meeting with this greatly learned Vaishnava who he accepted as his eternally worshipable gurudeva. While traveling to various holy spots in the Vraja area such as Radha Kunda and Govardhana, Bhaktivinoda came to know of the oppressive and wicked acts of a band of dacoits known as the Manjharas. These wicked men would spread all over the roads of the Vraja area and would rob and murder innocent pilgrims to gain their own selfish ends. Through the Thakura’s undaunted will and untiring labor for several months the whole fact was brought to the notice of the Government and a special Commissioner was appointed to crush the activities of these powerful bandits. The result was wonderful and the name of the Manjharas has forever been extirpated from the face of the earth. By this noble act Bhaktivinoda Thakura protected all of the residents of Vraja Dhama from further disturbances. From Vraja Mandala Thakura Bhaktivinoda came to Calcutta where he purchased a house near Bidana Park at 181 Maniktala Street (the present day name is Ramesa Datta Street). He called this house 'Bhakti-bhavana' and it was here that he established the daily worship of Sri Giridhariji. At the end of his leave from government service he was again transferred and this time he took charge of the sub-division of Barasat. At this time when Bhaktivinoda was staying at Barasat he met the well-known Bengali novelist Bankima Chandra, who at that time had just finished writing a book about Krishna. Bankima Chandra wanted to take this opportunity to show his work to Bhativinoda Thakura, who he knew was an authority on all subjects dealing with Krishna as well as an expert writer. This book was full of Europeanized ideas and speculations and stated that Krishna was just a mundane person with some good qualities. For four straight days, taking very little food and hardly any sleep, Bhaktivinoda put forth arguments with shastric references, and in this way solidly proved and convinced Bankima Chandra to change his ideas and his book to agree with the divine teachings of Lord Caitanya Mahaprabhu. Thakura Bhaktivinoda use to say, “Knowledge is power”. In 1886, the last year of his stay at Barasat, the Thakura, at the request of Babu Sarada Carana Mitra, ex-judge of the Calcutta High Court, undertook the task of publishing a good edition of the Srimad-Bhagavad-gita with the Sanskrit commentary of Srila Visvanatha Cakravarti Thakura and his own Bengali translation called Rasika-ranjana. When published, this work was received by the public with the greatest delight and all the copies were soon exhausted. Bankima Chandra wrote the preface to this edition and acknowledged his own indebtedness to Bhaktivinoda with the remark that all Bengali readers will be very much indebted to the Thakura for his saintly work. From Barasat Bhaktivinoda was transferred to Sriramapura. While residing here Thakura Bhaktivinoda visited the residence of the great associate of Lord Nityananda, Srila Uddharana Datta Thakura at Saptagrama. He also visited the place of Abhirama Thakura at Khanakula and the seat of another great devotee of Lord Caitanyadeva, Vasu Ramananda at Kulinagrama. Here at Sriramapura he composed and published his masterly writing of Sri Caitanya-sikshamrita, Vaishnava-siddhanta-mala, Prema-pradipa and Manah-shiksha, etc. During this time he was also publishing the Sajjanato on a regular basis. In Calcutta during this period, the Thakura established a printing press at Bhakti-bhavana which he called ‘Sri Caintanya Yantra’. This he established for the preaching of pure Hari bhakti by publishing Vaishnava literature. On that press Bhaktivinoda printed many books such as the famous Sri Krishna-vijaya by Maladhara, his own Amnaya-sutra and the Caitanyopanishad of the Atharva Veda. In Bengal this Caitanyopanishad was very rare and hardly anyone had ever heard of it. In search of this book, Thakura Bhaktivinoda traveled to many places in Bengal. Hearing of his search, one devoted Vaishnava pandita named Madhusudana dasa, who had in his possession one old manuscript of the book, immediately sent it to the Thakura from his place at Sambalapura. By the request of the Vaishnava community, the Thakura wrote a Sanskrit commentary on the book and called it Sri Caitanya-caranamrita. Madhusudana dasa Mahasaya also did a Bengali translation of the verses of Caitanyopanishad and called the translation Amrita-bindu. After Bhaktivinoda brought out the first printing of Caitanyopanishad, the copies were soon exhausted. With the encouragement of a few devotees, Thakura Bhaktivinoda, in the heart of Calcutta, established a society which he named Sri Visva Vaishnava Sabha. This society was set up for the preaching of the pure religion of bhakti as taught by Sri Gauranga Mahaprabhu. To acquaint the public with the functions and aims of the society, the Thakura published a small booklet entitled Visva-vaishnava-kalpatavi. During this period the Thakura brought out an edition of the Caitanya-caritamrita with his own Bengali commentary, called Amrta-pravaha Bhasya. At this same time he also introduced the Caitanyabda or the Caitanya era by which one calculates the year date beginning from the appearance of Lord Caitanya just as in the Christian world the year date is calculated from the birth of Jesus Christ. Thakura Bhaktivinoda also gave much assistance in the propagating of the Vaishnava almanac known as Caitanya Panjika. The appearance day celebration of Sri Caitanya Mahaprabhu is the principle fast day in the Gaudiya Vaishnava Sampradaya and is now observed with great respect. This was made possible by the Thakura’s sincere efforts in the matter during this time in Calcutta. Giving lectures and readings on books like Bhakti-rasamrita-sindhu is various Vaishnava societies, Thakura Bhaktivinoda gave the chance for the seed of pure devotion to grow in many people’s hearts. He published in the Hindu Herald, an English periodical, a detailed account of Sri Caitanya Mahaprabhu’s life. At this time the learned society of Vaishnavas gave Kedaranatha Datta the title of ‘Bhaktivinoda Thakura’ and from that time onward he has been known by that name. In the year 1887 Thakura Bhaktivinoda thought within himself, “Quickly taking leave from government service I will go to some forest in Vraja on the sandy banks of the Yamuna and perform bhajans with Bhaktibhringa Mahashaya till the end of life.” In this way the Thakura continuously reflected within himself this desire. One time on some government service he went to the town of Tarakeshvara. There in Tarakeshvara one night Bhaktivinoda had a dream in which the Supreme Lord in his form as Sri Caitanya Mahaprabhu appeared to him and spoke. The Lord said to Bhaktivinoda, "You will certainly go to Vrindavana, but first there is some service you must perform in Navadvipa, so what will you do about that?" Upon saying this, the Lord disappeared and the Thakura awoke. Bhaktibhringa Mahasaya, upon being told of the dream by Bhaktivinoda, advised the Thakura to apply for a government transfer to the district heardquarters at Krishnanagara, which was right near Navadvipa. The Thakura made great endeavors to get a transfer to the land of Lord Caitanya and to gain this end he even declined to accept the offers of the personal assistant to the Chief Commissioner of Assam and the office of the Minister of Tiperrah State. He even applied to the government for pension with a view to retire from government service, but the application was not accepted. Thus failing in his efforts to be relieved of his official duties, he at last arranged in December of 1887 a mutual exchange with the Deputy Magistrate of Krishnanagara, Babu Radha Madhava Vasu and thus went to Krishnanagara to execute his mission given to him by the Lord. While stationed at Krishnanagara Thakura Bhaktivinoda would go again and again to the present day city of Navadvipa and search in various places for the birth site of Sri Caitanya Mahaprabhu. One time, in the dead of night, Bhaktivinoda sat on the roof of the Rani Dharmashala in Navadvipa chanting the Holy Name on his beads and as he looked out toward the north he spotted a very tall Tala tree with some very strange substance attached to it. Near the tree was a small building which gave off a remarkable effulgence. Seeing this vision, the Thakura became extremely eager to find the true place of Mahaprabhu’s appearance. With this in mind he went to the Krishnanagara Collectory where he began to study some very old manuscripts of Caitanya-bhagavata and Narahari Sarakara Thakura’s Navadvipa Dhama Parikrama as well as some old maps of the district of Nadia. Going to the nearby village and inquiring from many of the elderly people there, Bhaktivinoda came to know of many facts about the modern-day town of Navadvipa and the old Navadvipa on the eastern banks of the Bhagirathi River. After this, through much research and endeavor, Thakura Bhaktivinoda was able to understand that the place he had seen that night on the roof of the dharmashala was the actual site of Sri Caitanya’s birth. The year was 1887 and this discovery was a shining landmark in the history of Vaishnavism in India. Thakura Bhaktivinoda had brought to light the divine place of Caitanya’s birth and his discovery was confirmed by Jagannatha dasa Babaji, the then religious head of the Gaudiya Vaishnava community in Nadia. On that eventful day thousands of visitors were present at the spot where a grand Vaishnava festival was held. Jagannatha dasa Babaji was so old at the time that he had to be brought there carried in a basket. He could not walk but once he came in contact with the spiritual atmosphere at Sri Caitanya’s birthplace, he literally jumped in the air in ecstasy, confirming the significance of the location. The result of this discovery was the production of a book by Bhaktivinoda entitled Navadvipa Dhama Mahatmya. Earlier in 1887 when Thakura Bhaktivinoda first came to Nadia as magistrate, he again met Jagannatha dasa Babaji who was then living in a very old house at Ravasghata. Bhaktivinoda renewed the house and repaired it using his own money. When he took leave from office for two years, he acquired a plot of land at Sri Godrumadvipa, commonly known as Svarupaganja. On that land he built a house for performing his bhajana after retirement from government service. He called the place ‘Surabhi Kunja’ and in the year 1890 he established at that place the ‘Nama Hatta’ (market place of the Holy Name) for preaching the glories of Harinama for the welfare of all. Jagannatha dasa Babaji sometimes came to stay there and have kirtana. Previously Lord Nityananda had established His Nama Hatta at this same place in Godruma. Therefore, out of humbleness, the Thakura always considered himself a mere street sweeper of the Nama Hatta of Lord Nityananda. After the discovery of Mahaprabhu’s birth place at Mayapura, Jagannatha dasa Babaji and Thakura Bhaktivinoda began worshiping Sri Caitanya Mahaprabhu there. Once one of the Thakura’s young sons was suffering from a skin disease and Jagannatha dasa Babaji told the boy to lie down at the birth site of Lord Caitanya. The boy followed his instructions and the next day he was cured. As he was not keeping good health at Krishnanagara, Bhaktivinoda requested the government to transfer him to a good healthy station. Thus in the winter of 1888 he took charge of the village of Netrakona in the district of Mayamanasimha. From Netrakona he came to Tangaila and from there he was transferred to the district of Vardhamana. At the time when Bhaktivinoda was staying in Vardhamana he would have kirtana with the devotees of Amalajora headed by Ksetra Babu and Vipina Babu. After composing his kirtana poems like Soka-satana, he would have them sing the poems in their kirtans. In June of l890, having been put in charge of the sub-division of Kalana, Bhaktivinoda would often go visiting many various holy places in Bengal such as his place in Godrumadvipa, the city of Navadvipa, Capahata, Samudragara, Cupi, Kasthasali, Idrakapura, Baghanapara, the place of Nakula Brahmacari at Piyariganja and the place of Vrindavana dasa Thakura at Denura. After his stay at Vardhamana, Bhaktivinoda was transferred for a few days to Ranaganja from where he again came to Dinajapura. In 1891 Thakura Bhaktivinoda took leave from government duties for two years with the aim of preaching Harinama [the chanting of the Lord’s Holy Names, such as Hare Krishna] for the benefit of all souls. During that time he made his base of activities for Nama Hatta in Sri Godrumadvipa. He visited places such as Ghatala and Ramajivanapur and in those places he lectured in many different societies, clubs and organizations. With great enthusiasm he continued his word for the Nama Hatta by lecturing on the Holy Name and the teachings of Sri Caitanya in many highly respectable societies in Krishnanagara. In March of 1892 the Thakura, accompanied by several other Vaishnavas preached the Holy Name in different places in the Basirahata district of Bengal. As, on the one hand, he was busy with his pen, so on the other he was equally engaged in preaching Harinama and Vaishnava philosophy by making circuits of several districts. He opened many branches of Nama Hatta in different districts of Bengal to preach Harinama regularly, and the names of God rang loudly everywhere in the ears of the people. It was a grand project and it proved a great success, for the tide continued for many years, even long after the period when the Thakura was called back by the government to perform his responsible public duties and when he could himself devote little attention to his own mission, in spite of his strong desire to do so. From the district of Rasirahata, Thakura Bhaktivinoda set out on his third trip to Vrindavana and along the way he stopped in Amalajora to celebrate the Ekadashi day with Jagannatha dasa Babaji. Upon reaching Vraja Mandala, Thakura Bhaktivinoda, in great ecstasy, visited all the forests and places of Lord Krishna’s pastimes, such as Bilvavana, Bhandiravana, Manasa-sarovara, Gokula, Madhuvana, Talavana, Kumudavana, Shantanu Kunda, Bahulavana, Giriraja Govardhana, Radha Kunda and Syama Kund, etc. From Vrindavana Bhaktivinoda returned to his Bhakti-bhavana in Calcutta and from there he began to give lectures and readings on the Holy Name of Krishna in various places. In April of 1893, at the request of Sir Henry Cotton, the then Chief Secretary to the Government of Bengal, Bhaktivinoda rejoined the office at Sasarama where he had to tide over a political difficulty, which then appeared in the province, in quelling disturbances which arose out of animosity between the Hindus and Muslims for the killing of cows by the latter. He had to try that case under difficult circumstances but finally he obtained thanks from the Lieutenant Governor and was reposted to Krishnanagara during the winter of that year. In February of 1891 during Thakur Bhaktivinoda’s leave from official duties, he was invited to speak in Krishnanagara before a large congregation of highly learned men from various places in Bengal. He gave a lecture concerning his investigation and research into the actual site of Sri Caitanya’s birth place at Sri Mayapura. After hearing his discourse they all became extremely delighted and unanimously applauded the Thakura for his noble work. Out of that assembly the Sri Navadvipa Dhama Pracarini Sabha was formed for spreading the glories of Navadvipa Dhama and Sridhama Mayapura. Later on that year, on the full moon appearance day of Sri Caitanya Mahaprabhu, a large sankirtana festival was held in which the deities of Lord Caitanya and Vishnu Priya [Sri Caitanya’s wife] were installed at Mahaprabhu’s birth site. The installation was held with great pomp and splendor and thousands of Vaishnavas attended from all parts of India. At this time all the learned panditas of the Navadvipa area, considering all of Bhaktivinoda’s evidence, accepted beyond a doubt that this was the true place of Sri Caitanya’s appearance. In October of 1894, at the age of fifty-six, Thakura Bhaktivinoda, against the wishes of his family and the government authorities, retired from his post as Deputy Magistrate. He felt it was too much of an inconvenience on his work of preaching the Holy Name and the glories of Sridhama Mayapura. After his retirement, he came to stay at Surabhi Kunj in Godruma from where he engaged himself in preaching the divine philosophy of Sri Caitanya Mahaprabhu. At this time he revised his old writings and gave to our hands the highest form of ideas that a man can have of the knowledge of the Supreme Being. He devoted himself to Harinam without any break, avoiding the influence of materialism and the hypnotism of Maya. He was living at Navadvipa and sometimes in Calcutta writing his books. While in Calcutta he went from door to door determined to beg a rupee from each and every Hindu gentleman for the noble purpose of building a temple for Lord Gaura and Vishnu Priya at the Yogapitha in Mayapura. His efforts were a success and he then arranged for the construction of a magnificent temple at the birth site of Sri Caitanya Mahaprabhu. In July of 1896 Bhaktivinoda traveled to the mountainous state of Tripura by the strong desire of the king of that state who was a devotee of Lord Vishnu. Bhaktivinoda stayed in the capital of Tripura for four days and preached the glories of the Holy Name to the people there. On the first day he lectured on the eternal principle of bhakti and the true spiritual form of the Holy Name of Krishna. His lecture was full of deep philosophical thoughts and innumerable and unheard of before Vedic evidence supporting all his points. Upon hearing this lecture all the panditas and highly learned gentlemen present were stunned with amazement and they could now easily perceive the transcendental beauty of Hari-bhakti and the Harinama. On the next two days there the royal family and the general public obtained great ecstasy by hearing the Thakura speak on the pastimes of Lord Caitanya Mahaprabhu. The Thakura’s Caitanya Mahaprabhu, His Life and Precepts, though in itself a small work, continued to be admired by the western thinkers and writers. This is evident from the following comments made by the erudite European scholar Mr. R. W. Fraser, late of the Madras Civil Service. “Five hundred years have passed away since the time Caitanya spread a faith in the saving grace of Krishna throughout the land, nevertheless to the present day, the same spirit that inspired Caitanya continues still to dwell among his followers. “In an interesting account of the life and precepts of Caitanya lately published by his devout and aged follower, Sri Kedarnatha Datta Bhaktivinoda, it can be read how this spirit preserves its vitality undiminished amid the changes that are sweeping over the land. This exponent of the hopes of the present followers of the teachings of Caitanya declares his firm faith, that from a devoted love to Krishna, a love like that of a girl for a loved one, shown by constant repetition of His name, by ecstatic raptures, singing, calm contemplation and fervour, a movement will yet take place to draw to the future church of the world ‘all classes of men, without distinction of caste or clan to the highest cultivation of the spirit. This church it appears, will extend all over the world, and take the place of all sectarian churches which exclude outsiders from the precincts of the mosque, church or temple. During the rainy season of 1896, because of the wish of the Maharaja of Tripura, Thakura Bhaktivinoda spent some days preaching in Darjiling and Karsiyam. In 1897 the Thakura traveled and preached in many villages and towns such as Medinapura and Sauri. In this way, by spreading Sri Caitanya’s message, Thakura Bhaktivinoda was delivering the people of Bengal from the darkness of materialism and atheistic philosophies. At the beginning of the twentieth century Srila Bhaktivinoda Thakura returned to Jagannatha Puri. When his son, Bhaktisiddhanta Sarasvati, was residing at Puri as a naisthika brahmacari [completely celibate brahmana] and was engaged in his bhajana at the Gandharvika Giridhari Math, one of the seven mathas near the samadhi tomb of Haridasa Thakura, Bhaktivinoda, for helping his son’s worship, had this monastery repaired and cleaned. When Srila Bhaktisiddhanta Sarasvati left Puri to reside at Sri Navadvipa Mayapura, Bhaktivinoda gave up all connection with the Gandharvika Giridhari Matha and constructed his own place of bhajana on the sea beach there. He called this place Bhakti Kuti. At this time the Lord sent the Thakura a nice assistant and disciple in the form of Sri Krishnadasa Baba. He became very dear to Bhaktivinoda Thakura and was the Thakura’s constant attendant right up till the last moment of Bhaktivinoda’s life. Manifesting at Puri, his place of bhajan at Navadvipa, Svananda Sukhada Kunja, the Thakura would perform his bhajana in solitude. At this time many impious men tried to disturb him, but happily their efforts proved futile. Many good souls got spiritual inspirations from him and were saved. Men of all description visited him there, but none went away without receiving the Thakura’s blessings. In the year 1908 just three months before Thakura Bhaktivinoda took sannyasa, one of his sons, who at that time was working at the writer’s building in Calcutta, came home one day and informed his father that Sir William duke, who was the Chief Secretary to the governor, was in Calcutta. Thakura Bhaktivinoda had worked under this gentleman when he was a magistrate. The next day Bhaktivinoda made an appointment with him and went down to the writer’s building to see him. Just outside the building Sir William Duke met Thakura Bhaktivinoda personally and taking him into his office with folded hands, he made a plea to the Thakura: “My dear Kedaranatha, when you were District Magistrate I wanted to take you out of the office. I thought that if there were many men as qualified as yourself in Bengal, then the English would have to leave.” Sir William Duke used to read the judgments that Thakura Bhaktivinoda would make on his court cases and he always became amazed. He would also come to the house of Thakura Bhaktivinoda and study his actions. He saw that he was always writing. At that time he was writing the Caitanya-siksamrita. Bhaktivinoda Thakura’s wife, Bhagyavati, would feed Sir William Duke with puris, luchi and sweets every time he came to their house. William Duke was always so amazed at how Bhaktivinoda was so active. In this way Sir William Duke admitted that he wanted to do some harm to Bhaktivinoda without letting the Thakura know, but now he was begging for the Thakura’s forgiveness. The English custom is that when a man becomes aged he would approach anyone who he had committed some offense to beg their pardon so that when he died he could pass away very peacefully. After Thakura Bhaktivinoda heard this apology he said, “I consider you to be a good friend and well-wisher all along.” The Thakura admitted later that he was astonished that this man was seeking the opportunity to harm him. Because of Sir William Duke’s noble and honest conduct Thakura Bhaktivinoda became very much pleased with him and gave William Duke all his blessings. In 1908 Srila Bhaktivinoda Thakura formally accepted the dress of a paramahamsa by taking sannyasa at the place in Jagannatha Puri known called Satasana. At this time he was still writing some books and staying sometimes in Navadvipa and sometimes in Calcutta. In the year 1910, for being constantly engaged in the service of the Divine Couple of Vraja Dhama [Sri Sri Radha-Krishna], the Thakura shut himself up, pretending to be afflicted with paralysis, and entered into a perfect state of samadhi. These days were very happy for him as he could thus shun the turmoil and bustle which are the concomitant parts of worldly existence. On the day of the commencement of the sun’s southern course, June 23, 1914, corresponding to the disappearance of Sri Gadadhara Pandita, just before noon in Jagannatha Puri, the dearly beloved of Sri Caitanya Mahaprabhu, Srila Saccidananda Bhaktivinoda Thakura, having satisfied himself that his mission bore at least some good to the world, departed from this mundane plane for his eternal services to Radha and Krishna in the divine realm of Sri Vrindavana Dhama located far beyond the tiny vision of the conditioned souls of this world. Thakura Bhaktivinoda’s samadhi ceremony was delayed till the sun began its northern course. At that time his last remains were placed at his home in Godruma in the midst of sankirtana of the Holy Name. It was a pleasant clear day and a grand Vaishnava festival was held with the greatest solemnity in which thousands took part and the Thakura’s divine presence amidst them was perceived by all. If we examine Bhaktivinoda Thakura's daily schedule while he was staying in Jagannatha Puri we will be able to see how he was never idle and was always engaged in the service of the Lord. Between 7:30 PM and 8:00 PM the Thakura would take rest and would rise from bed just before 10:00 PM. At that time he would light his oil lamp and begin to write books up to 4:00 AM. Then he would take a little more rest and would rise just before 4:30 AM for washing his hands and face and at that time he would sit down and chant on his beads. He never showed his japa-mala to anyone and he would chant unlimited number of rounds daily. Around 7:00 AM he would dispose of all correspondence and at 7:30 he would read various highly philosophical religious books. At 8:30 if anyone came to see him they could meet him then. If no one came he would continue to read up until 9:30 during which time he would walk on the veranda of the house and think of different religious questions and solve them in his mind. Sometimes he would solve them out loud as if he were preaching to someone. From 9:30 AM to 9:45 he would take a little rest and at 9:45 he would take his morning bath and breakfast, which consisted of half a quart of milk, a couple of chapattis and some fruit. At 9:55 he would put his office dress on and go to the court in his carriage. As a Magistrate he would wear a coat and pants. On his neck he wore six strands of double size Tulasi beads. He was very strong in his court decisions. He would decide them immediately. None could stand before him and he did not allow any humbug in his court. He would do his business and go. He would go to the court wearing those pants, his big coat, his neck beads and tilaka on his forehead. He would shave his head monthly and he never cared what anyone thought. At 10:00 AM court would begin and he would hear between thirty to fifty cases. He would finish by 1:00 PM. Bhaktivinoda’s capacity for work was astounding to the lawyers and Englishmen. What other Magistrates would finish in thirty to forty-five minutes, he would finish in five minutes and he would also write the judgment in detail within one or two minutes. The Englishmen over him were stunned at how he could perform this much work in such a short amount of time. They all became envious and tried to discourage him. At 1:00 PM he would come home and clean himself and become refreshed. Before 2:00 PM he would again be in the office. At 5:00 PM he would come home and take some Sanskrit religious books and dictate them in Bengali to someone. After this he would take his evening bath and meal which consisted of a little rice, a couple of chapattis and a half-quart of milk. Bhaktivinoda worked with a pocket watch so everything he did was done on time. In this way we can see how Bhaktivinoda was always eager for the service of the Lord and was always engaged in that service despite his family and official responsibilities. As for his quality of being charitable, it was never heard that any brahmana ever went away from his home disheartened and he who once called on him was sure to be seen meeting him again with a smiling face. He equally befriended the other castes, and especially when he preached Harinam everyone however high or low he might have been, in society or in wealth was nearest and dearest to him. He had practically no enemy in the world as he did not cherish any kind of animosity against others. Rather those who tried to be his enemy out of jealousy or with a view of thwarting him from his spiritual path were in the long run ashamed of their conduct and in most cases begged for his pardon which was never refused. His universal brotherhood made him the friend of all and he was ever eager for procuring the greatest welfare for the people of this world. Whoever once came in contact with him, could not but go without having obtained some good to himself. Thakura Bhaktivinoda was never proud and his amiable disposition was a characteristic feature in his life. He never uttered a word to anybody which could wound their feelings. He did not chastise anyone unless and until he was perfectly confident that he had a right over him to do so for his welfare, and on the other hand he who received a warning from him always thought himself gratified. He had not the least shadow of vanity and was totally devoid of a quarreling habit. He was honored and respected throughout the length and breadth of Bengal, Bihar and Orissa. His profound knowledge of philosophy endeared him to all educated men and his devout bhakti made him the friend both of the highest and lowest classes of people. In his official capacity he was always taken into confidence by the superior officers of the government, as he was himself well conversant with the policy of government. He had witnessed the hard days of the mutiny and while in office, he assisted the government in quelling all sorts of unprincipled disturbances. The Government of Bengal also on more than once occasion wanted to vest him with honors and titles, but he humbly declined the same each time, on the ground that such honors would, instead of doing good, stand against his holy mission. From his very infancy till his last day he was a great advocate of truth and never allowed his associates to deviate from the path of duty, which he himself observed with more than strict accuracy. He avoided companies whenever he had the least suspicion of evil motives in them. He had to encounter unpleasantness on many occasions in the execution of public duty under the government, by refusing to accept any present from any person. Similar difficulties he had to face in refusing unjust requests from persons who were very dear to him. He was above corruption. Bhaktivinoda never supported the least shadow of immorality and he never crossed the threshold of any place which he knew to be immoral. He had great dislike for theatres as these were places where public women were brought in to take part in the play. He knew that common people, who cared little for religion and who spent their days carelessly and uselessly, were apt to go astray in the broad wilderness of the world if he himself refrained from showing them the proper way by his own example. Example is better than precept and so his absolute distaste for anything immoral helped many sincere souls to open their eyes and also persons already in confusion to correct themselves. When the well-known Girisha Chandra Ghosa came to request Thakura Bhaktivinoda to preside over the gathering on the opening day of his new play, ‘Caitanya Lila’, he had to politely decline the offer. Thakura Bhaktivinoda was a complete abstainer from any kind of worldly pleasure and would not even chew a betel. He completely avoided the luxuries that are everyday enjoyed by ordinary men. He had for himself very little want and led a most simple life throughout his career. The word ‘debt’ was, as it were, unknown to him for he was very prompt in making payments. He was always true to his word and punctuality was at all times specially observed by him. He always showed a brave front and was never a coward. He never performed any dishonest work in business and whatever he did he did openly for the good of his fellowmen. In this way we may understand that he possessed a spotless character. Thakura Bhaktivinoda had a fine mode of delivering speeches and his lectures were so greatly attractive that he could keep the audience, whatever be their number, absolutely dumb-founded. His speeches were all very fluent and argumentative from the philosophical point of view and he had a nice way of joining the link of their subject matter. He was an expert linguist and knew English, Latin, Urdu, Persian, and Oriya besides Bengali and Sanskrit. He had also a taste for history and a keen habit of research. This habit made him a voracious reader of all the Puranas and Vedic Shastras as well as the writings of numerous authors of repute in Europe, both of ancient and modern. He was a member of the Royal Asiatic Society of London. He had thoroughly gone through the scriptures of foreign countries, such as the Bible and Koran, and he could easily cite any passage occurring in those books whenever there was occasion to do so. His nature was to leave no stone unturned in mastering whatever subject he took up and he did his duty in that respect to the fullest extent. The works he has left to the world are most precious and will no doubt supply materials for the improvement of many thinkers for centuries to come. Thakura Bhaktivinoda was a great author and poet and has left for us about one-hundred books of transcendental knowledge. From the age of twelve and thirteen when he wrote Hara-katha and Shumbha-Nishumbha-yuddha till his last days before us, his pen was never idle and many a night saw him engaged in his library after he had performed a hard laborious midday duty in the court. He wrote hundreds and hundreds of poems and gave those songs to his disciples who would put them to music and sing them. All knowledge of Vaishnava philosophy can be found in them. The Vaishnava community has received from his beautiful lotus hands many wonderful books on Lord Caitanya’s precepts. His famous work Jaiva Dharma, a Bengali novel which teaches Vaishnava philosophy in the form of various discourses, up to the present day has remained very easily readable and relishable for all classes of devotees, learned scholars and even fools and laymen. Bhaktivinoda’s Bhagavatarka-marichi-mala, which is the butter produced from churning the vast milk ocean of Srimad-Bhagavatam, has bestowed much good upon the serious student of the Bhagavatam. His explanations and Bengali translations of Krishna-karnamrita, Brahma-samhita and others have obtained a place in the hearts of all Vaishnava readers. His Harinam-cintamani and Bhajana-rahasya are eternally worshipable for all pure devotees. His Sri Caitanya-siksamrita and Sri Krishna-samhita stand as divine classics in the history of Bengali Vaishnava literature and his books of poetry and songs, such as Sharanagati, Gitavali, Gitamala, and Kalyana-kalpataru, will always be chanted and sung by those pure souls devoted to nama-bhajana or service to the Holy Name. It is our fervent hope that some day all the works of Thakura Bhaktivinoda may be made available to English speaking people for their eternal spiritual well-being. Thakura Bhaktivinoda’s mission in this world was fulfilled by his starting the Nama Hatta at Nadia through which he distributed religious pamphlets and preached the name of Hari at every house in Bengal. At every step of his life he displayed a transparent godliness that can be observed by studying his life and writings. In his writings he has taught the difference between a true spiritualist and a pseudo one in order to thwart the vain attempts of the many pseudo devotees at that time who dressed as Vaishnava mendicants just to fill their bellies. Consequently because of this the intelligentsia of India began to recognize the truth of his preaching and the beauty of Sri Caitanya’s doctrines. He was thus recognized as the God-sent pioneer of the movement of unalloyed devotion to Godhead. He taught the people of India the true teachings of Sri Caitanya Mahaprabhu both by precept and example. He always stressed that the jiva soul cannot realize himself or God unless he wholeheartedly surrenders himself to the lotus feet of a genuine spiritual master and listens to his words. Bhaktivinoda has taught us true renunciation by engaging all things in this world in the service of the Creator. He radically opposed the caste system where one is socially judged by his birth and he taught very explicitly that one should be judged by his actions and personal qualities and not by mere birth or family lineage. He also strongly protested against both elevationsim and Salvationism as being anti-devotional, that mere belief in such concepts took the place of attaining the real devotional mood necessary for spiritual development. Thus he made a tremendous effort both in his powerful writings and personal preaching effort to reform the growing materialistic mentality of the people at that time. He taught that men should live their lives according to the principles laid down in the Srimad-Bhagavatam and practice the chanting of the Holy Name of the Lord. Thakura Bhativinoda showed through his clear and lucid writings that the solution to all contending theories, isms, sectarian dogmas and doctrines could be found in the teachings of Sri Caitanya Mahaprabhu. With an open and liberal mind, he opened the door of comparative religion and philosophical study and thus showed the universal applicability and scientific, religious, and philosophical basis of the teachings of Sri Caitanya. In this way the Thakura lifted the spiritual cataract on the religious vision of the people of Bengal by his many writings, which were both revolutionary and endowed with the quality of sweet reasonableness. He preached that the universal religion and common function of all souls is devotional service to the Supreme Lord Krishna and ‘Back to Home, Back to Godhead’ ‘was the motto he taught and practiced throughout his life.